How are u doing! Are u planning any holidays soon.Its summer season so mostly people do plan a little vacation every now and then.Travelling is exciting but packing up stuff to be taken along can be difficult sometimes.I believe that for us ladies one of the most important stuff to be taken along is our makeup & make up brushes.I usually try to travel light but mostly I fail as I stuff my make up bag with loads of stuff and brushes.But now I am sure I can travel light with some make up & this beauty that I am going to review today! 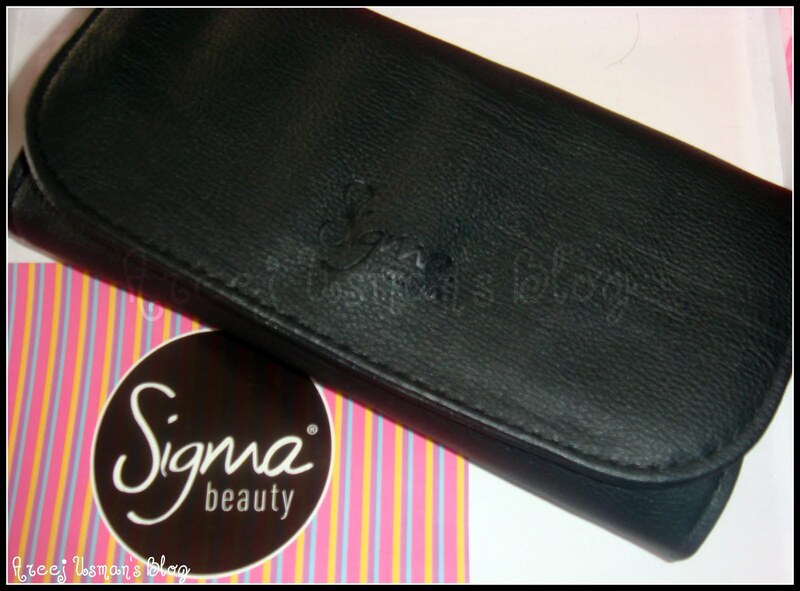 Its the Sigma Travel Kit Naughty in Black!I was sent this by Sigma for review. The Travel Kit Naughty in Black contains seven essential brushes to achieve a flawless look on the go. Take Naughty in Black to your favorite travel destination or keep it in your purse for a quick touch-up during the day or an evening out on the town. 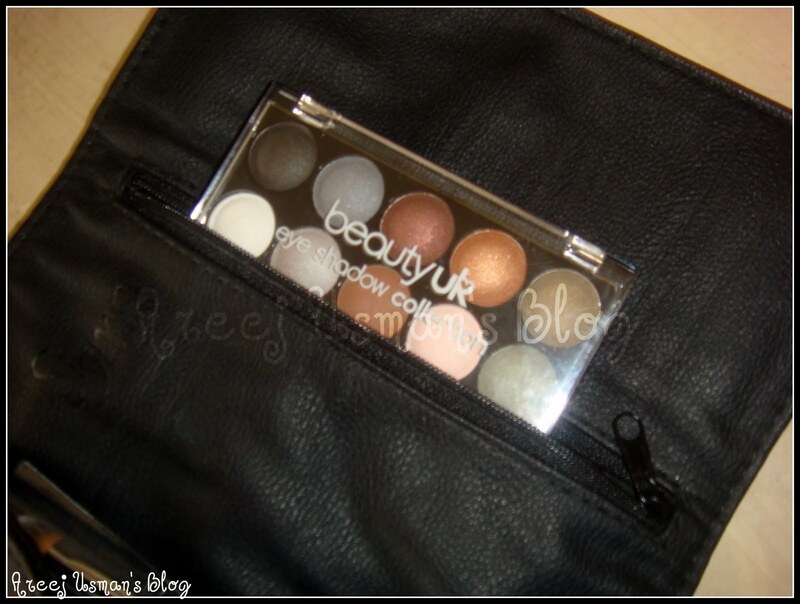 All brushes are individually stored in a stylish metallic black clutch equipped with a convenient pouch to carry all your must-have makeup items. 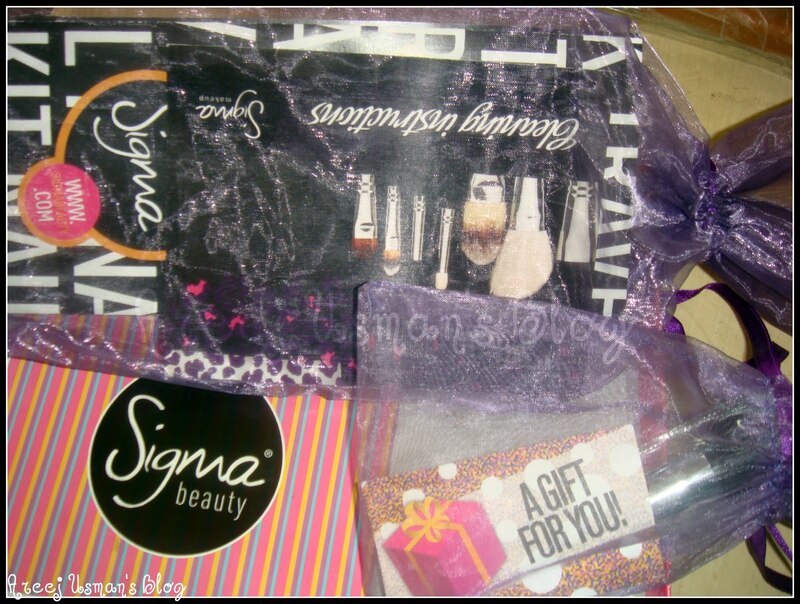 First of all I really appreciate the packaging of the brush kit by Sigma.I loved the purple pouch with all the leaflets and care instructions for the travel kit.And to add to my happiness was a Gift i.e the Sigma F30 Large powder brush tucked up in a similar but small purple pouch. 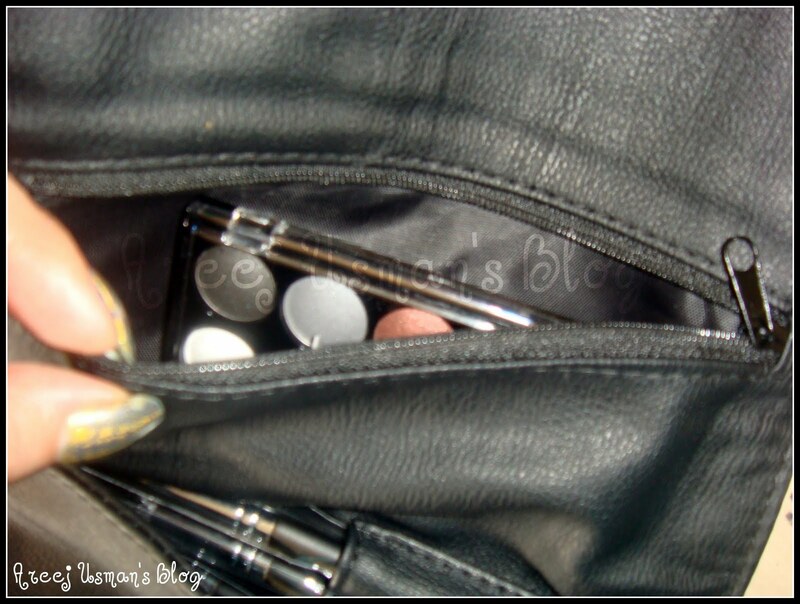 The brush roll is made up of soft rexine leather like cloth with 7 individual places for the seven brushes that come with it.In the middle is a zipper section where you can stuff some make up essentials like lipglosses or kajals.I would love to store my Beautyuk palette in it though.The kit has a magnet inside the rexine stuff and it doesnt show up on the outside.We just fold it and there it is safe & sound!Its size is the same as a small handy clutch bag.Its material and magnet clasp makes it easier for us to pack it in our hand bag while on the go. 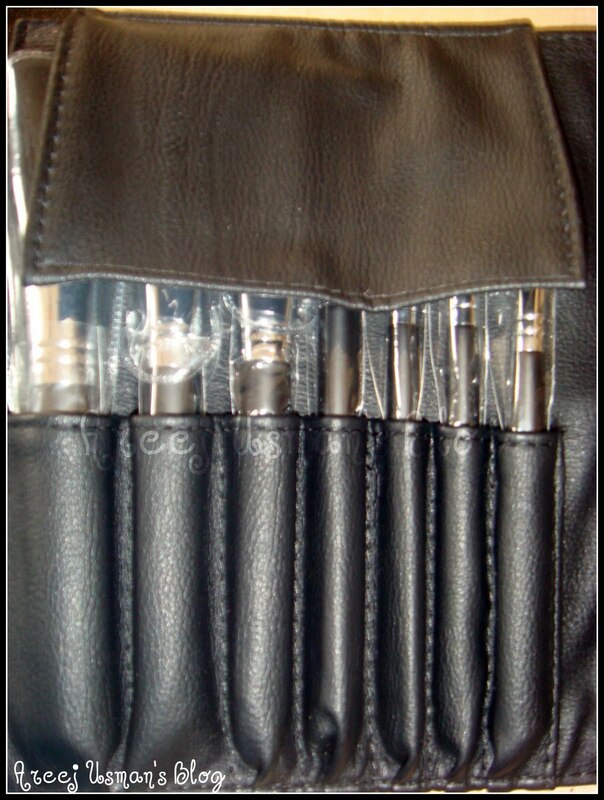 The three largest brushes come with brush guard while the smaller ones are easliy protected by the help of the rexine flap that covers the tops. The gift brush also comes with a brush guard. 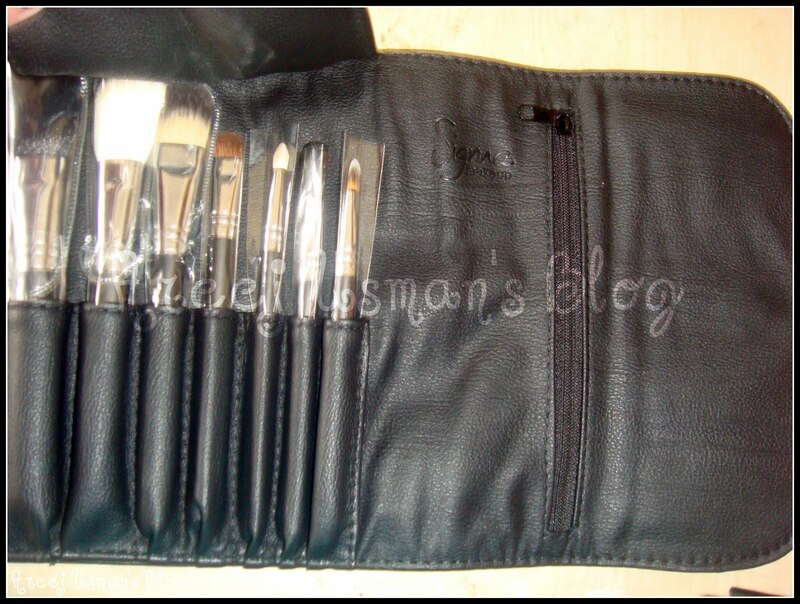 Lets get to the brushes:There are 7 brushes in it.5 of them are natural haired & 2 of them are synthetic. My thoughts about it: This is a wonder brush specially made for precise smudging of the eye shadow on the crease and outer V.
My thoughts about it: Its natural bristles are very soft to work with & the trick is to blend a little eye shadow in first go and then build on. My thoughts about it:The thing I love most about this brush are the short & neatly packed fine bristles.Good to be used with everyday eye shadows,eye pigments & loose eye shadows.It has a thicker handle as compared to the other smaller brushes in the kit. Concealer – F70 – The rounded, tampered, flat shape makes this brush ideal to conceal the under eye area. It is also recommended for a precise application in small areas. Synthetic bristles. My thoughts about it:This brush has the look of a mini foundation brush .Its very useful to apply and work on liquid or stick concealers.The soft bristles helps in great blending & smooth finish.This is the 2nd brush in the smaller brush lot with a thicker handle.A similar brush of The Body Shop is here for comparision. 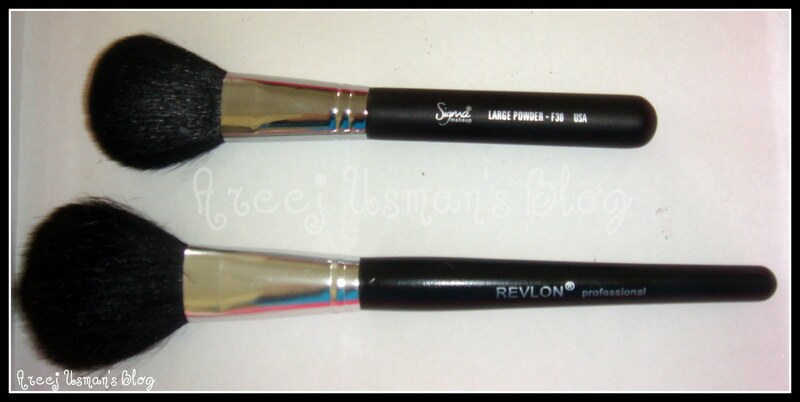 My thoughts about it:Its a mini sized Large powder brush.Though I would prefer to have a powder brush with a bigger handle still it will do to be used on the go.Here is a comparision with Revlon professional Large powder brush. My thoughts about it: This is my favorite brush in the kit.This is also my first countouring brush.Firstly I was worried about using this brush but I noted that the angled side helps in precise application of the bronzer or the countouring powder.The bristles are very firm so try picking small amount of powder with it. My thoughts about it:This brush is a very close dupe for MAC’s 190 .I have placed them both together so you can have a better view.I can not say that its just as good as the MAC one but still it is a much affordable one. After using this kit for about a month I am really loving it.Its perfect for travelling and if I want I can remove a brush or 2 that I dont want and drop in some other brush I want to take with me.Its a great value for money product as it is priced at $49.I consider this very reasonable for the quality that Sigma is providing us with.Buy it once and you ll not regret your decision. If you want to order click here.It is also available in a Pink shade. For more information on Sigma click here & to find them on Facebook click here. & The Winner is here! Great review. Especially liked the angled contouring brush.What do you think about the luscious brush set? have you tried it? @Pandora'a Box:I bought some individual brushes from Luscious bt not the whole brush set.The bent eye liner brush from Luscious is my fav. dang it looks tempting! awesome review areej :)lucky you,you got it :D. sigma changed their incentive program did you see that?